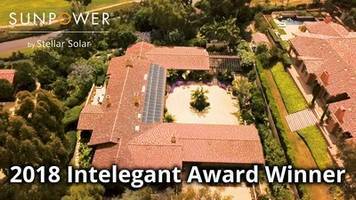 San Diego, March 15, 2019 /PRNewswire/ -- SunPower by Stellar Solar, a San Diego-based solar installer founded in 1998, has received the SunPower "Intelegant Award for Excellence" for an exceptionally well-designed and installed residential solar project commissioned in 2018. The 19-kilowatt (kW) award-winning rooftop system is producing clean energy from the Singer residence in Rancho Santa Fe, Calif.
"SunPower by Stellar Solar has demonstrated superior craftsmanship with the sleek design and installation of this SunPower system, featuring premium solar panels that are unmatched in performance, reliability and aesthetics," said Norm Taffe, SunPower executive vice president, residential solar. "We congratulate SunPower by Stellar Solar for their extraordinary delivery of such an elegant home solar project, and look forward to their continued success as a SunPower dealer in 2019." The beautiful SunPower® Equinox™ system includes 54 SunPower X21-345-AC modules, each with a factory-integrated SunPower microinverter, and SunPower® Invisimount™ mounting hardware. The installation on this high-end custom home presented some unique challenges that brought into play SunPower by Stellar Solar's 20 years of experience and keen attention to detail. The homeowner assigned his teenage son to research and select the best company representing the best solar panels in San Diego. His research was extensive and SunPower by Stellar Solar energy consultant Keith Davey found himself working with a very educated teenager during the initial vetting process. The deciding factors that won the job included the company's 20 years in business, consistent ranking as San Diego's best solar company in the Union Tribune Readers Poll, the plethora of positive and realistic Yelp reviews, and the no-pressure, no-gimmick educational approach of Keith Davey. "We are honored to receive the 2018 'Intelegant Award for Excellence' from SunPower," said Kent Harle, CEO of SunPower by Stellar Solar. "SunPower's innovative residential solar solutions combined with our reputation for high-quality work and customer service will help ensure that this solar energy system delivers economic and environmental benefits for the next 25 years or more." For more information on SunPower by Stellar Solar, call 866-787-6527 or visit www.stellarsolar.net. AC Solar Panels incorporate AC microinverters.